This topic contains 12 replies, has 3 voices, and was last updated by DruggedBunny 2 months, 1 week ago. 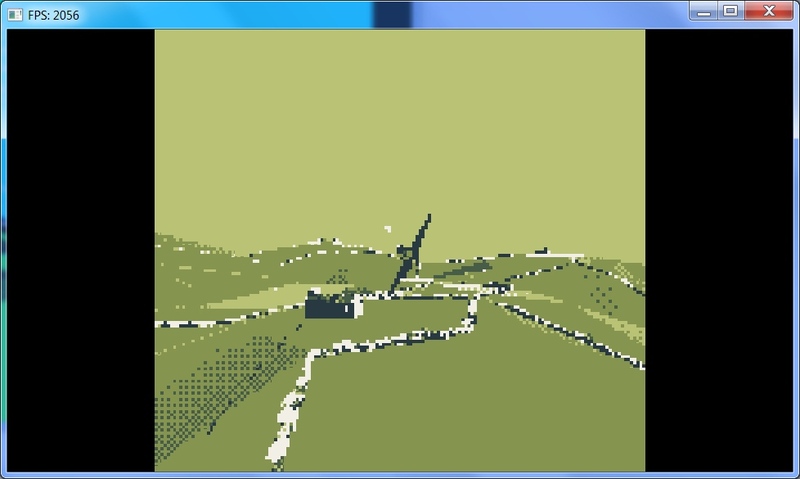 This is a very simple pixel shader for modifying images using a GLSL shader. 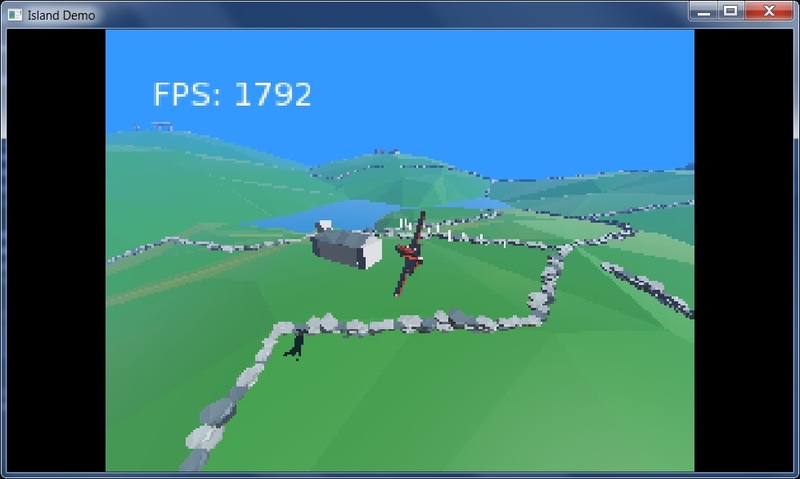 It’s formed of two parts, the Monkey2 code and the GLSL shader code. A pre-made zip setup can be downloaded here.
' Adapted from DoctorWhoof's Plane Demo -- thanks, DoctorWhoof!
' NOTE: The "Toggle" string is received in the shader code as m_Toggle, ie. is automatically prefixed with "m_". // If Toggle = True, set to B & W version of pixel, else draw default. image for drawing the resulting shaded image. To set/get shader variables, you use the image.Material‘s Set/Get methods, as in the SetInt (“Toggle”, toggle) seen in this example. The Toggle string here relates to the m_Toggle value in the GLSL code (notice that the GLSL variable name is formed from this string, auto-prefixed by mojo with “m_”). Thanks to DoctorWhoof (aka. Ethernaut) for the render target code and PixelPaladin for the example GLSL interfacing code. Hit L to go Low-res, Spectrum-style, with attribute clash. 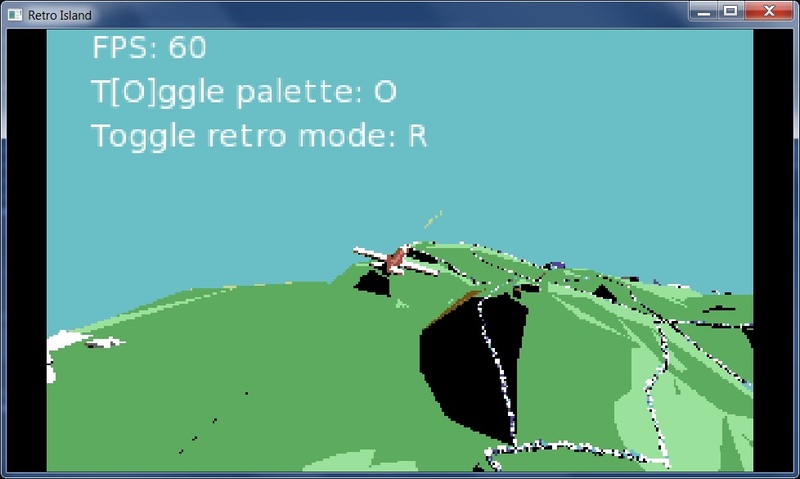 Hit P in low-res mode to toggle real colours. Full-screen it! L gets back to normal res/colours. Still WIP, but finally got a decent-performing shader that at least outputs legit Spectrum-compatible imagery, needs much tweaking still. 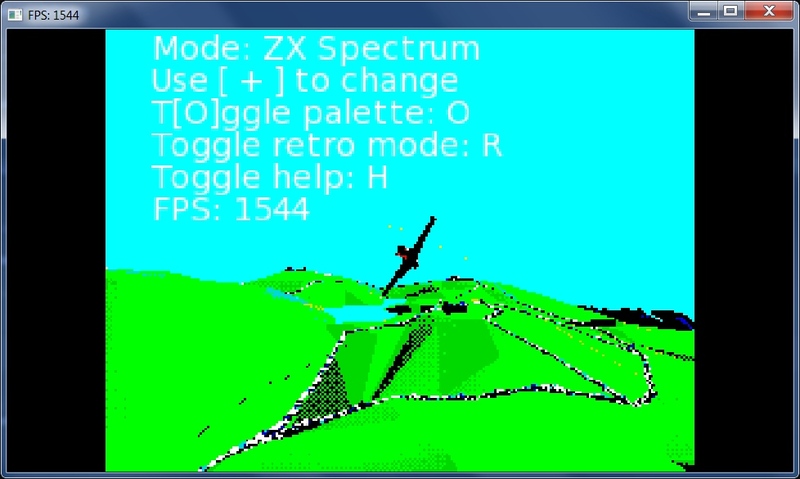 In theory, you could save a bunch of frames and display them for real on the Spectrum, as-is… which I’ll eventually try. Which browser are you using? It’s not working on Chrome! Working fairly nicely in FireFox! Ah, only tried in FF, web not really being my main target, but had to do a few tweaks to get that to work. 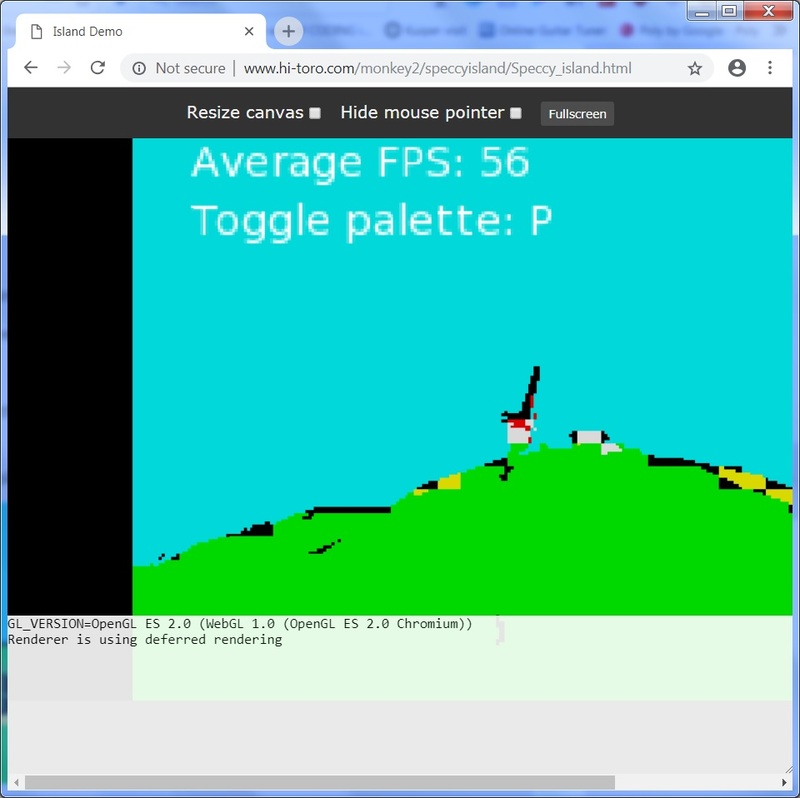 Get the impression cross-browser shaders are not a lot of fun! Hmm, weird, just installed Chrome and it’s working fine here! What platform/gfx card you on? 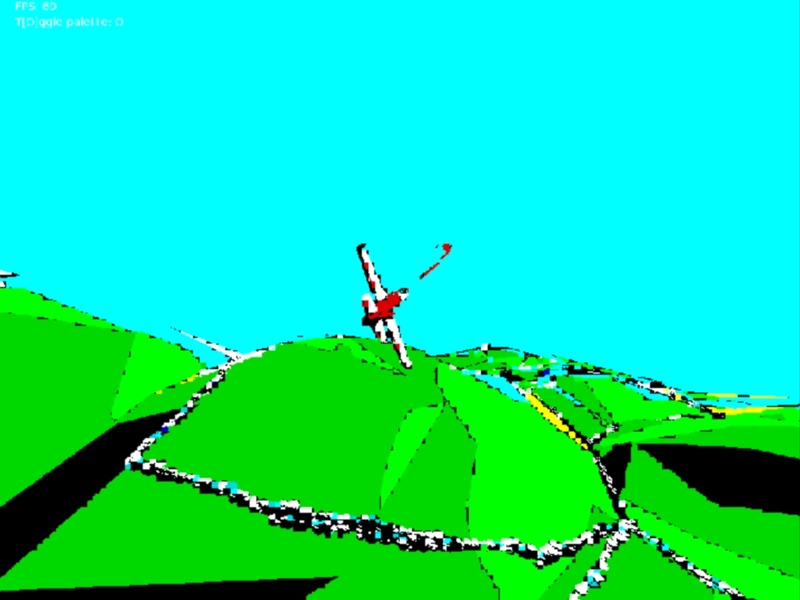 Well, 256 x 192 is rather a “challenging” candidate for turning a low-contrast, fairly washed-out, realtime rendered scene into 8 Spectrum colours (each with associated ‘dark’ version) with correct colour-clash, and without sampling every 8×8 block of pixels (a MASSIVE framerate hit since GLSL isn’t meant to read anything other than the ‘current’ pixel), it wasn’t feasible to select a suitable foreground and background colour that avoided constant flickering between the two as the scene changed, so I’ve amended the Spectrum’s display size. Here’s how the scene would be rendered if the Spectrum’s display size was 1024 x 768 instead of 256 x 192, but still with correct colours and clash. Updated and placed code on GitHub. 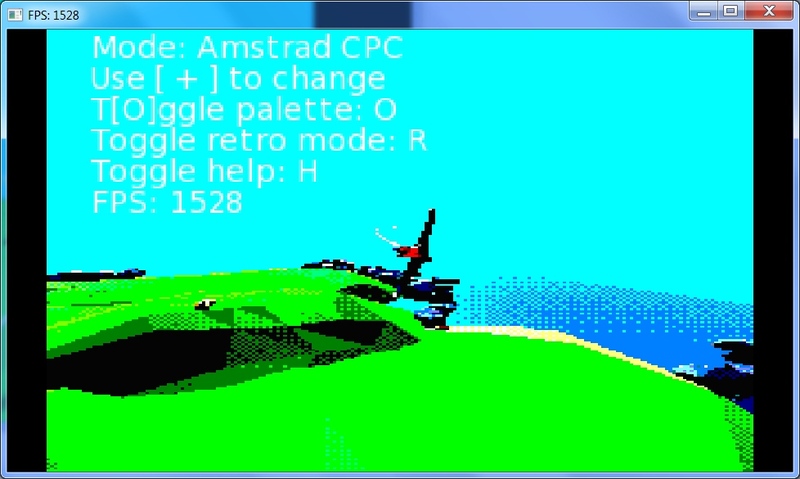 Next up will have to be simple Amiga 32 and 256-colour modes, maybe 320 x 200 and/or 640 x 512, and SNES? It’ll be the shaders needing tweaked, probably… I’m only testing on Firefox just for throwing up quick demos, but my own interest is desktop. As I mentioned, shaders and web browsers seem to be a minefield of misery. Hit [ and ] to cycle through a few cool ‘retro’ modes. Hit H to hide text in retro mode. Tested in Firefox, Chrome and Vivaldi on Windows 7 64-bit only. Download code from GitHub and build natively if it fails for you!